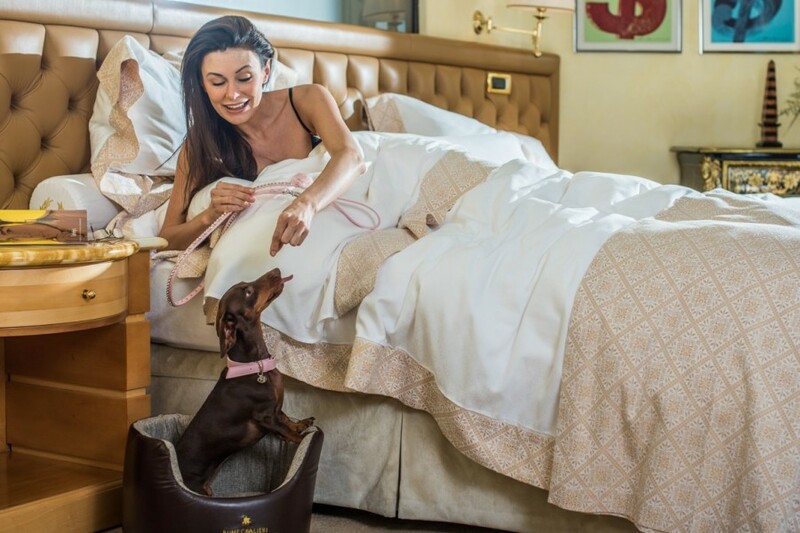 Contessa of the Cavalieri is an elegant Daschund that calls the Rome Cavalieri her home. Admittedly she is a pampered pooch with refined taste, but her high standards ensure pet perfection for your canine companions. Pet guest services include a delicious doggy menu, and dog walkers for pooch personal training in our fifteen acres of parkland. While you pamper yourself in our Grand Spa, your pet’s new best friend can whisk them over to La Domus Aventina, a nearby doggy spa for a shampoo, massage and stylish comb-out. The Rome Cavalieri boutique holds other doggy essentials all vetted to Contessa’s exacting standards. Pets are warmly welcomed at the Tiepolo Lounge & Terrace and also the Imperial Club although not on furniture unless in their own kennel. Sadly due to rules way beyond Contessa’s control her four-legged friends are not allowed in La Pergola Restaurant or L’Uliveto, and regrettably not in the Rome Cavalieri shuttle bus, but we will very quickly make private arrangements for you. While the Cavalieri Grand Spa Club is for humans only, we will be delighted to organise some pet pampering at a nearby specialist spa.